Hey all Dangerous Doug here, I just wanted to drop you some updated info and let you know what's coming down the pipe soon. Thank you all for watching, sharing and liking the show #LunchWithDoug without you it is not possible. We have T-Shirts now designed and are using them as prizes on the show as well as having them for sale for $12 each if you order in advance or $15 each at events. Let us know if you would like to pre-order a shirt by calling 417-684-1732 or Message us on Facebook. We had some technical difficulties last week so a few of the past webisodes have not been put on here at Community Follower so if you are looking for them they can probably be found at the Official Lunch With Doug Facebook page and we will be getting them here soon too but if you can't wait please go there. 100th Episode on the horizon! 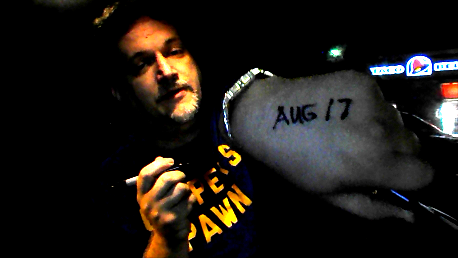 We will be celebrating it at (and making it) at Jim's Roadhouse in Nevada, Missouri from 7-10 pm on Thursday, August 17, 2017 BE THERE OR BE SQUARE. Lunch With Doug #93 "In the Car at Taco Bell"
lunch with Doug #88 "Chair Mart Truck Day"
Lunch With Doug #87 "Wrap Wednesday Show"
Lunch With Doug #86 "Rooster Booster"
Join myself and my awesome local business friends Exotic Pet Stop Carquest Auto Parts Ellis Furniture Backroads Steakhouse Taco Bell Belle Rose Lunch on the Square & Catering too J&R's Home Store David Hayes Nevada Square Flea Market & Consignment Ice Cream Escape Art Shop Blue Roc Rooster Nevada Consignment Auction Rinehart Jewelry Co. The Bulldog Brew Davison's Shoes / Verco Sporting Goods and more at Noon today for two great episodes of Lunch With Doug. I had some technical issues yesterday and was not able to get the final show up so today Webisode #86 and #87. Thanks for your continued support on this project and as always "Thank you for spending your lunch with me"
Lunch With Doug #85 "Ice Cream Escape to Ft. Scott"